Just over a month ago, I wrote a post about the different types of self care where I discuss nine different kinds of self care that are all important for wellness. Having good self care is more than just occasionally taking an evening off to binge your favorite show, or taking a luxurious bath. It is a mindset. It is a collection of small habits that you do on a regular basis to maintain your health and happiness. My approach to improving myself care is to make small changes, on a weekly basis, to help me form habits that will help me feel healthy, energized, motivated and happy. Of course, I use my bullet journal to keep track of these changes, and to reflect on my progress. This week, I am focusing on improving my physical self care. What is Physical Self Care? Take a moment to reflect on your own physical self care. Are there any obvious gaps in how well you are presently taking care of your body? Do you need more sleep? More movement? Better nutrition? For myself, I take a 25 minute walk several times a week and I do a 12 minute stretching/yoga routine three times a week. I also pack my lunch everyday and I eat most of my dinners at home. I try to incorporate lots of fruits and veggies into my daily meals. I frequently floss, and I see the dentist every 6 months. I see my doctor at least annually, if not more often. I try to maintain a somewhat consistent sleep schedule too. There are definitely many ways I can improve my physical self care routine, but it’s also important to acknowledge the good things I am doing! So…yay for all of the above! I feel like there is room for improvement in all the areas of my physical self care with the exception of perhaps making and keeping routine appointments. However, there is one thing in particular that I’ve been wanting to work on lately. As I said before, good self care is a collection of small everyday habits that make you feel better. This week I’ve added one new goal to my to do list- form a better hydration habit! I do drink water and I typically have water with me. However, I don’t drink as much as I’d like to. Drinking a certain amount of water a day (such as 8 glasses) or trying to drink as much water as you can isn’t useful or healthy despite the common myths surrounding it (https://theness.com/neurologicablog/index.php/how-much-water/). My problem is that I’m not always drinking when I’m thirsty. I check-in with myself often throughout the day to record my brain state, emotions, etc… as part of my work with EBT. One of the things I record is physical states or body sensations such as hunger, thirst, feeling too hot and anxiety symptoms. I’ve noticed I record “thirsty” quite a bit. I think I need to do a better job of noticing, acknowledging and responding to thirst. I’m currently testing out an app that tracks water intake, but I might come up with another way of working on this habit. Mainly, I just need to remind myself to drink more often. Keep a record of what you eat for a couple days. Also record how hungry you were before you started eating and any other activities or emotions. Make some observations about your logs. Track how many servings of fruits and veggies you eat daily for a week. Average it. The following week aim to get that average one higher than it was the week before. Look up what a serving of fruit and veggies looks like. Make a list of fruits and veggies that your really enjoy. Use it for inspiration when you go shopping. Find a few new healthy recipes to try, or start a healthy recipe board on Pinterest. If you track your steps, look at your average daily step count. Try to increase that next week by 500. Start taking an extra 20 minute walk each week. Find an exercise you can do at home (hula-hooping, an exercise machine, etc…) and schedule a weekly session. Increase your normal exercise routine by 5 minutes. Think of something you enjoy doing that requires movement (playing basketball, swimming, geocaching, playing Pokemon Go) and make plans to do that. Track and/or log your sleep. Make some observations. Setup an evening routine that helps you fall asleep. Try meditating before sleep to increase your quality of sleep. Adjust your thermostat settings so that you are cooler when you sleep. Make a doctor’s appointment- either an annual check-up or for an ongoing problem you’ve been having. Ask a doctor for suggestions on treating an ongoing problem such as allergies. Make an appointment to get a massage. Replace your toothbrush or toothbrush heads. Ask your dentist for suggestions on how to improve your dental hygiene- perhaps getting an electric toothbrush or using a flouride mouthwash. Start a skin care routine. Find time to rest- take a relaxing bath, sit on the porch or take a nap. Replace an item of clothing or shoes that no longer fits or isn’t comfortable. Make your own list of physical self care activities. Will you be taking the time to improve your physical self care this week? How? Let me know in the comments! Finding time to write on the blog this week has been such a challenge! Both the work and home life have been SO busy. This post has taken me a full week to write! Ideas for blog posts are oozing out of me (my January trip to WDW, souvenirs from Disney, earring collections, sticker collections, self care posts, Sims stories, bullet journal spreads, cat and dog updates and more! ), but there just isn’t enough time in the day. I have a wonderful full time job that I am super grateful for, but I really wish I could be a full time blogger! If you have a preference about what I write about next, please let me know in the comments. It will help me decide! One of my aims for this blog is to help you find new hobbies or other means of finding more joy in your life. To that end, I give you just a sampling of what I have been enjoying lately. Let me know if anything catches your interest! Also, if you have any recommendations for me leave those in the comments too! 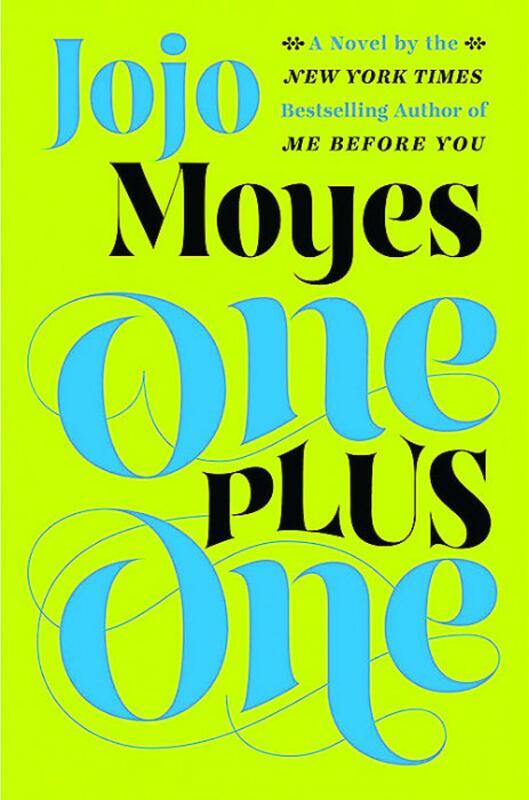 I recently finished One Plus One by Jojo Moyes. It is an adorable feel-good romantic comedy. I was in the mood for something heartwarming and fluffy, and that’s what I got. Don’t get me wrong, it was a page-turner and I did stay up very late one night to finish it. Also, I’m not very big on physical love scenes (yawn for me)- I’m all about emotional attachments, and this was perfect! If you are ho-hum about romantic comedies but think you might want to try one, I highly recommend giving this one a go. It is supposed to be one of her best, but I’ve never read anything else by her. Thanks to this book I might be more willing to check out a romantic book in the future. My husband and I also just finished watching seasons 1 & 2 of “The Good Place”, an American fantasy comedy. While season 3 exists, only seasons 1 & 2 are available on Netflix. The show has gotten great reviews, and was highly recommended by some friends. It did not disappoint! The writing is wonderful and the actors are superb. The story is unique and is constantly moving forward. I quickly became attached to all the characters. While always funny, it is also, at times, intense and heartwarming. I LOVED it and highly recommend it! I can’t wait for season 3 to drop on Netflix. I love organizing gatherings with my friends. However, I’ve lived, worked and gone to school in many places and I have friends all over the states these days. Getting together as a big group is much harder, but it is SO worth the effort! Right now, I’m planning a weekend trip for some of my friends, and we are using a site that calculates the midpoint between all our homes (we are scattered from Michigan to New Jersey, and down thru Virginia). I use Doodle Polls to find out who is interested in attending and when they can make it (do this months in advance for better success!). Once I know who is going we calculate the midpoint using something like: https://www.whatshalfway.com/. And then we get a house with enough space for all of us on something like AirBnB or https://www.vrbo.com/ (I prefer the latter). For my friends, we plan to stay at the house, play board games and chat. If you planned one for your friend group you could also explore the area, go hiking, watch movies all day, cook a meal together…whatever your particular group of friends loves to do. It’s like having a big sleepover party with adults, and it’s amazing. I highly recommend it. I listen to about 15 podcasts a week at the moment. I only listen to one episode of each every week as I’m not a fan of bingeing. While I enjoy all the pods I’m listening to, my current favorite is a fairly new addition to my list. I’m only about seven episodes into it, but I’m madly in love with it. I’ve been doing a lot of research in the area of self care, and experimenting with how to improve my own self care. It’s not just taking “me” days and allowing yourself an ice cream sundae. It involves everything from doctor’s appointments to journaling , and from budgeting to calling your mom. I’m planning on doing additional posts soon, but you can checkout my first one on: the Types of Self Care. Two Point Hospital came out last year from Two Point Studios as the spiritual successor to the 90’s game Theme Hospital. It’s a hilarious business simulation game about running a hospital. The humor is whimsical and silly, but also quite clever with lots of wordplay. The game has a lot of detail, and they’ve already come out with quite a bit of DLC for it, so there is lot to keep you coming back. I immediately fell in love with the game, and it always makes me happy. I started playing it the week it came out, but this past weekend I returned for another fling, as I have done many times since downloading it and hope to continue doing for quite some time. And those are just some of the things that have been enjoying recently! Thanks for reading! About: What do I want from this site? Connections2: Round 1- Early spring with the Keye family! Sorcerer Catnerd! I won a giveaway! My site is still undergoing a bit of a reboot/reorganization and I’ve been considering how to separate various topics. I used to have separate blogs (all on this site) for the various topics I post the most about (Sims, Bullet Journals, etc…). I’ve condensed down to one feed now, but I do plan to have pages dedicated to specific topics. To help me decide which topics would be turned into their own pages, I took a look at my most popular content over the last year or so. One thing that I noticed was that my “about” page was one of the top pages. The first thing I want is the creation of a community. I have a have a habit of creating communities, or at least attempting to, where ever they fit into my life. For many years, I had Yahoo! groups dedicated to various interests of mine- mostly with friends or real life acquaintances, but sometimes strangers too. When I was younger (highschool through undergrad), I organized group trips of 10 to 18 people for a week long vacation in Maine, all staying in one house. Not all of the people were my friends- we had friends of friends, acquaintances and relatives too. I organized food, activities, games and tried my best to bring everyone together as a group. I now have several Slack communities I manage- one for friends, one for family, one for a game I like to run called Mafia, one for work, and one for a Pathfinder game I run. I also like to arrange group gatherings and trips among friends and family. Ultimately, I want to have some sort of community here. A community of people with similar interests. There might be a forum, or maybe a Slack workspace. I’m not sure how it will develop, but I want my readers to interact with me, the blog, and each other. I want to facilitate new friendships. I’d like games, events and snailmail swaps. I’m not sure how I’m going to get there yet, but it is my aim. Another thing I want to do is help people add more fun and play into their lives. There are plenty of reasons to be serious in life, but having fun is equally important for ALL AGES. Adults should be playing board games, collecting things that make them happy, and striving to have a sense of wonder and joy. It is important to be creative, learn new things, try new hobbies and seek out ways to make your life more fun. I have a lot of hobbies and I want to share them with you in hopes that you find something that interests you. If you are excited and happy about life you have more energy to get the things done that you need or want to do. I find sharing my journey quite inspiring and motivating. With whatever hobby or self care practice I’m trying out, blogging about it encourages me. Sometimes I find support through comments or tweets, but also the act of self reporting provides some accountability on its own. Thinking about topics from the perspective of a potential reader brings new ideas, interests and paths to the surface for me to explore further. When I layout a blog post on a particular topic, or am generating ideas for blog posts, I find inspiration for all aspects of my life. A few years ago, I was diagnosed with anxiety and depression. Since then, I’ve begun viewing everything with the lens of self care. I’ve done a lot of work with therapy, classes, research, mindfulness, meditation and health coaches. I’ve made some huge leaps in how I feel. I didn’t realize how intensely my mental health could impact my physical body when I started this journey, and I have learned so much about why self care is important. I want to help others become more self aware, and share the tools I have found in hopes they can help someone. Yes, someday I do want the blog to generate a little bit of income for me. Right now, it generates $0 and I’m okay with that. Oh, actually like -$50/year due to costs of domain, etc… I don’t know how I want to handle generating revenue yet. Integrity and honesty are very important to me, and I haven’t been totally satisfied by some paths I’ve looked into. I have a full time job that I like well-enough, but I really love blogging. In the future, I’d like for it to produce enough income that I can make blogging my primary job. Connections is a Sims 4 challenge that I’m developing. Right now, it is more of a play style than a true challenge, but we’ll see where it goes. It is a multiple household challenge that spans all the households in a save. Every round, you select a number of households based on the relationships of the previous round of households. The intended result is that you have a very interconnected set of households that have relationships with each other, but you are also not playing the same households over and over again. Your set of households shifts and changes as your story develops. 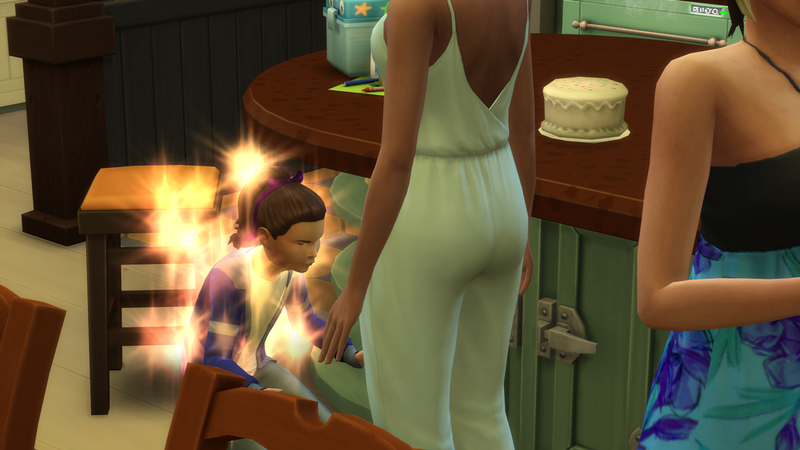 When I play a Legacy or another challenge that involves a single family for several generations, I get bored. However, I don’t have the time and patience to play challenges that involve rotating between all the households in a neighborhood. I get attached to individual Sims story lines and want to see them play out, so whole neighborhoods take too long. I also enjoy a bit of randomness in my game and I love playing households that I normally wouldn’t play or create. This is the first rules post, but I anticipate there might be more in the future as a refine the challenge. Decide if you are going to play with Premade Sims or Sims of your own creation. I like using the premade Sims that come with the game. For my starter household, I download a household off the gallery (such as a household made for a game trailer). Setup your neighborhood. Choose your starting family. Move any other Sims you want to be involved in the challenge into that save. Personally, I don’t add anyone except my starter family. However, there is no reason why you couldn’t. Establish the number of houses you wish to play each round, and how long you want to play each house. I suggest playing each house for an in-game week and using 3 to 5 households per round. You could easily change those numbers, though. Play your starter household for your chosen time. At the end of the time (such as a week), pause the game. Score the relationships (see below). Play each household for the chosen time frame. Pause at the end of each household’s play through and score the relationships. Combine the scores as described below. The first household is your starter again. The second is the highest total score from Round Two. The third is the second highest score from Round Two. Highest score from Round Three. Technically, you are scoring every Sim that your Sims know. However, you can quickly ignore anyone that is merely an acquaintance, as their total is 0. Further, we are not paying attention to relationship numbers/bars, just the labels the game generates (or if they are in a club with one of your Sims). So scoring goes pretty quick. Ignore Sims who are living in the household that you are presently scoring. For example, if Edith and Jake are roommates, and we are scoring their relationships because we just finished playing with them, Jake doesn’t get any points for being friends with Edith. 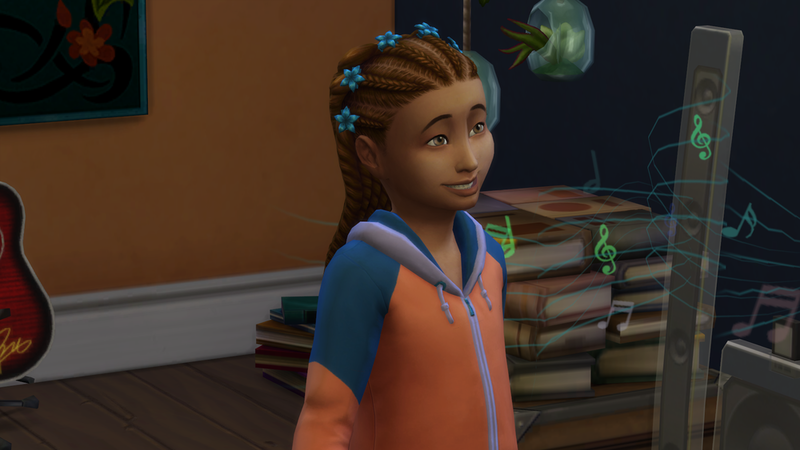 Chose the first Sim who is not a member of the household, and more than just an acquaintance. Record their name. Add the appropriate score next to their name. Scores stack. For example, if Edith works with (coworker +1) her best friend (+4) Samantha. Then Samantha’s score would be a 5. We are effectively summing the impact a Sim has on another Sims life. Score each Sim for each person in a household. Scores accumulate. If Edith has a roommate, Jake, who is “Love Birds” with Samantha. Samantha’s new score is 9 (+5 from Edith, +4 from Jake). Score all the Sims for all the households played in that Round. Scores continue to accumulate. For example, if our second household for this round consisted of Beth and Roger, and Samantha was good friends with Roger, Samantha’s new score would be 12 (+5 from Edith, +4 from Jake, +3 from Roger). Scores from different households played in the same round count. For example, if Beth is good friends with Edith, Edith will have a score of 3 this round, even though Edith couldn’t win any points from being friends with Jake since they share a household. Compare all the scores. Play the household with the Sim that earned the highest score. Okay, so I know that probably sounded SUPER confusing. However, it is actually pretty simple and quick to do. After I finish a round in my game, I will post my score breakdown as an additional example. I’m currently doing a play through of this challenge which you can follow along here: The Keye Family. I’ve become increasingly interested in self care recently. I want to feel happier and healthier, and proper self care seems to be the best path forward for that journey. I want to create some weekly self care goals in my bullet journal. While I could write a long list of all the different activities that would be good self care for me, I wanted to make sure I was considering all my options. Were there self care activities that I wasn’t thinking of that would be beneficial for me? As always, I did my research! What I found was that self care touches on all aspects of life and that I probably would not have considered all these areas. Or if I did, I wouldn’t have had a balance between them. I started with the simplest question- What is self care? According to Merriam-Webster, it is “Care of oneself.” Um...I could’ve guessed that much, thanks. I think you pretty much used the word in the definition there, and a teacher would have taken points off of you, Merriam. Google told me “the practice of taking an active role in protecting one's own well-being and happiness, in particular during periods of stress” or “the practice of taking action to preserve or improve one's own health”. Now there is a proper definition, thank you! Those definitions cover a pretty broad area. We need to consider our own health, happiness and well-being. Even on their own, those three areas (health, happiness and well-being) are complicated with a bunch of factors contributing to them. What factors should we look at? Here’s where the self care categories come into play. I consulted six websites and found a lot of overlapping information, but with some variety too. I’ve consolidated the information I found into the following list, and added my own examples. You can explore my sources in the links at the bottom if you’d like a second (or third, or fourth, etc...) take on this information. Find websites or apps that explain meditation, mindfulness or self compassion and complete a daily exercise in one of those areas. Listen to a science podcast such as Science Vs. Arranging a weekend trip with close friends. Light a candle with your favorite fragrance and put on fun or soothing music. Declutter and clean a shelf in your living room. Decorate your work area with a plant or favorite picture. Invest in a good desk chair. Wash your sheets, change your air filter, and vacuum often if you have allergies. Consider your work-life balance. If you feel like you are working too hard and finding no time for fun, reprioritize. Intentionally watch a tv show. Flipping channels when you are tired or putting something on in the background doesn’t count. Find a show you really enjoy and set time aside to do just that. Schedule a family game night. Call a parental figure you haven’t spoken to in awhile. Using either your DNA or information from your family, start researching your ancestors and genetic connections. If you live with someone, take a moment to consider the possibility of suddenly being on your own. Do you have the means to support yourself? Are there any activities that your partner, roommate or family member does that you might want to learn how to do? What can you do to prepare from a practical standpoint? Check to make sure you have smoke detectors in enough places in your home. Do they need new batteries? Should the be replaced? Do you need carbon monoxide detectors? Take a self defense course. Review your home and/or auto insurance. What areas of self care do think you need to work more on? If you want more blog posts related to self care be sure to check off the “self care” option in the poll in the sidebar! If you’d like me to go more in depth with each category of self care in future posts, comment below. It looks like I was pretty negligent on my hobbies, so I need to aim for a bit more balance. I ended up adding things to my weekly to-do list, but I checked off more than I thought I would. So, I’ve made a few more slots on the list, but left some of them blank to be filled in over the next couple days. I met my goals for steps, level up life and page views, so I can up my expectations on those a bit. It seems my EBT skills (the graph) drop off on Thursday/Friday which is something to be mindful of. Overall, I think last week’s layout worked pretty well. I didn’t use the schedule area (Sun, Mon, etc… beneath the calendar) so I shrunk that area and added a larger sticker. I added an “email” goal bar as I’m trying to clean out my inbox. I shortened the Self Care area, as I had too many goals. I also increased the blog area. Reduce E-mail Clutter: My inbox is overflowing. This week I want to drop the Google-labeled “important” e-mails from 560 to 510. So handling 50 e-mails. For my work-based health programs, I plan on walking 52,000 steps this week, doing three sessions of 11 minutes of stretching exercises, taking three mindful walks, getting at least six hours of sleep on five different nights and completing one activity for my Hooswell “Journey”. In my hobbies, I’d like to spend time playing The Sims, practicing doodling, organizing my Disney pin collection, and working on my next session of Dungeons and Dragons. I still need to give you a post about the “Level Up Life” app, but my goal in there this week is to earn 300 additional XP. I’m starting my next class series with EBT from a local provider, so keeping track of my check-ins and joy points (two EBT techniques) has become a priority. I’m hoping to get more of each this week. I’ve made a more specific list of things I want to achieve this week. In future week’s, I may do each task more than once per week, but for now I’m setting my goal at just once per week and see what happens. Thank you for being my accountability! ;) What are your goals for this week? Are there any topics/tasks/goals from above that you’d like to hear more about? Let me know in the comments! Hi!!! Thank you for reading. I really appreciate it. I also really appreciate comments, so please feel free to leave one below. This is the first post of my new Sims series and challenge- Connections. Connections is a rotational style of gameplay with a twist. With the exception of the first house, each household that you play is determined by the relationships with the preexisting households. I will get into the details of that when we switch families. This challenge is mostly about premade Sims that come with the game. I wanted to keep with that theme when I chose my first family. I decided on the Keye family from the Parenthood DLC trailer. 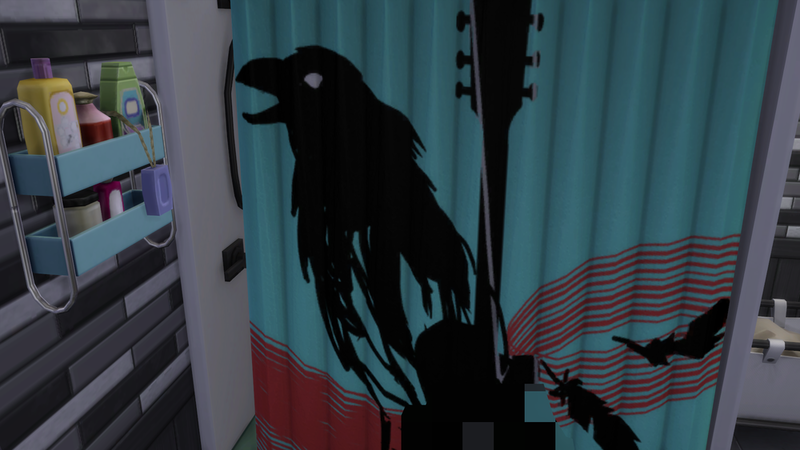 I downloaded both this Maxis made family, and the Maxis made house from the trailer from the Gallery. A few notes about how I play before I begin. First, I don’t use any custom content or mods. Second, I typically don’t use cheats. 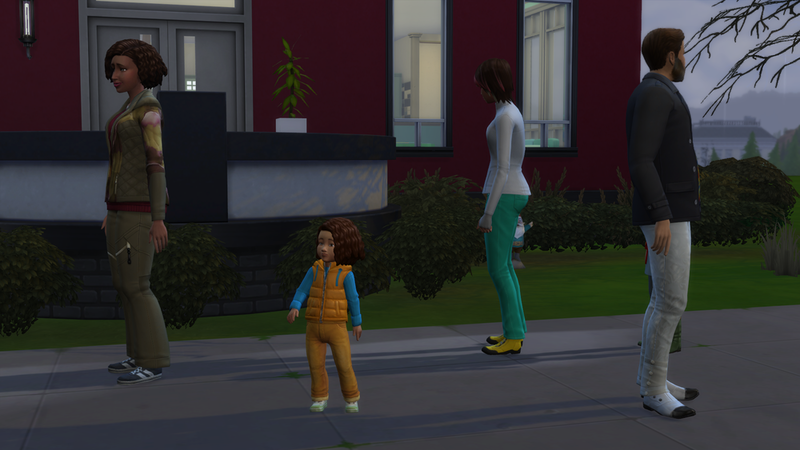 I used the money cheat with this family so I could set them up with their new home, but I do not anticipate using cheats in the future unless I need to recover from a glitch. Lastly, I typically let my Sims control the story, doing what they wish to do, fulfilling their aspirations, and responding to their actions and decisions. For some added drama, I may choose to add a randomly generated table of life events to subsequent rounds. It was not, however, used in this round. The Keye family has just moved into the region. They are the first house in a new area being developed known as Newcrest. There isn’t much in the way of places to visit or neighbors to get to know, but they did get a lovely new home. They are keeping their fingers crossed that more people start to move to the area soon. Their home is a very spacious two floor with four bedrooms, three bathrooms and plenty of living space. Plenty of space is important for this growing family! A large inheritance allowed them to make this move and they are so grateful for their new life. Karlie is a dedicated mother and home provider. She loves cooking, food, parenting, her husband, her kids, being involved and television shows. She has a reputation for being kind and loving. She does have a bit of a perfectionist streak, however. Jaylen, Karlie’s husband, is a bit of a couch potato, honestly. He’s not the tidiest person either. He’s also quite clumsy. Fortunately for him, Karlie finds all of it quite lovable. Jaylen loves collecting things and plants. He’s currently making his way as a gardener. Lori is their creative and well-mannered daughter. While polite and fairly responsible, Lori struggles with controlling her emotions. She tends to be a rather gloomy individual, and she is known to be the jealous type. She has a natural artistic talent and a wonderful imagination. She’s also very kind and attentive to her younger sisters. She’s currently going through a bit of a loud phase and music can frequently be heard pulsing from her room. Abbey Keye is innocent, perpetually cheerful and always does her homework. She’s energetic and loves to play outside. She is always trying to help her mother take care of her younger sister. Lastly, we have Aria Troublemaker Extraordinaire. Aria can be found playing in the toilet, making messes all over the house, or running naked outside. She’s always angry about something and doesn’t like to sleep during the same hours when everyone else is sleeping. She’s strong, fast and always needs to be moving. She prefers running around the house seeing what everyone else is doing and what is going on over actually sitting and playing with her toys. During the first half of spring, in the Keye household, most of the time was spent taking care of Aria. All of Karlie’s attention was on keeping up with the little bubble of energy. Despite Karlie’s best intentions, she couldn’t find enough time and energy in the day to really help Lori and Abbey adjust to their new school the way she had hoped she would. Aria was pretty eager to learn to run and climb, and to go potty on her own. Karlie enthusiastically helped her to do those things. Communicating was of less interest to Aria, but Karlie made sure they worked on those a bit here and there. Some days, Karlie could barely keep up. The family had to fend for themselves with whatever was in the fridge as Karlie had no time to make dinner. Piles of dirty dishes littered the living room coffee table. Aria’s high chair was covered in…Aria mess. And Karlie barely had time to throw together a sandwich to keep herself going. Ahh, the joys of motherhood! This giant amazing house has given Lori the luxury of her own bathroom, a teenage girl’s dream. Unfortunately, an awesome house does not make up for the struggles and anxieties of moving to a new school. Lori still has no friends at her new school and is struggling to get ahead in her classes. Those stressors plus a predisposition to be gloomy, toss in a general bad day and you have a recipe for crying in the bathtub all evening. So heartbreaking! Of course, the sisters have been there for each other this whole time. Even little Aria who loves to dance her heart out in Lori’s room to Lori’s favorite bands. Aria, Abbey and Lori have become closer while adjusting to this new place, finding friendship in each other while friendships outside the family are lacking. Karlie and Jaylen decided to have yet another kiddo,. Sure, their family was a little chaotic, but they loved it that way. Aria was going to be transitioning to a child soon, so Karlie was optimistic she could handle another toddler. While Jaylen and Karlie found keeping up with Aria to be exhausting, they also found it very joyful. They are always happy! Some days things went well. Some days Aria and Karlie were able to eat breakfast at the same time, at the table and the table was clean! These were good days. As Aria grows older and is able to communicate, it has become clear that Abbey aspires to be as good of a big sister as Lori is to her. Finally, the day arrives. Karlie gives birth in the hospital with Jaylen by her side to yet another girl. They name this one Krista. The new parents are ever so excited to have expanded their family yet again. Jaylen offers to take over all the parenting for a day so that Karlie can get out of the house and make some new friends in the area. She joins the Upper Crusts so she can hang out with fellow foodies (such as Clara and Hugo, pictured above). She also gets invited by a random elderly lady named Antoinette to a lounge for drinks and karaoke. Antoinette invited her to a party after the lounge, but it was already midnight and Karlie was partied out. Shortly after the birth of Krista, it was Aria’s turn to transition into a child. The birthday festivities were small given the lack of friends the family had made, and because they had a new born. As it turns out, Aria’s wild antics might not be over yet. As a child, Aria is hot-headed with poor conflict resolution skills. Not entirely unexpected given her personality as a toddler, but will her fiery temper cause some drama in this perfectly peaceful household? One of my greatest tools for self care and mental health is my Bullet Journal. I tend to keep my Bullet Journal pretty simple, like the original method by Ryder Carroll, with the focus more on planning, goal setting and self-reflection. While I sometimes use washi tape or stickers, or add in the occasional doodle, those only happen when I have time and/or a creative outlet is beneficial for me at that time. By recording what I expect to do every day and what I actually did on any given day and then comparing the two, I’ve been able to adjust the expectations I have on myself. On a day to day basis, I’m kinder to my self and I’m finding more balance in my life. I still have time struggles, though, particularly on weekends and with my overall picture of what I am accomplishing on a larger scale. Effectively, my life to-do list is long and ever-growing, even though on a day to day basis I’m forming more reasonable expectations. My therapist has suggested that I start applying the methods I use for day to day on the scale of a week. Weekly Spreads are a pretty common thing in the Bullet Journal community. I’m trying to keep my new weekly spreads simple while motivating. I’m trying divide my goals by category to help give me an idea of balance. The goals side of my spread involves a lot of self care. I keep a separate work Bullet Journal as I have a 40hr/week job that has plenty of responsibilities and such to keep track of. The idea is that when I go to create my new weekly spread, I review the old one. If I didn’t finish a group of goals or tasks, I try reducing the amount a bit or relocating things that are less important to the monthly list. For things that I did well in and can push myself to do more (steps, sleep, etc…), I’ll increase the amount or add more tasks. This week I have some to-do list tasks plus a variety of goals. I have health goals for the programs at my workplace that I participate in. I created a list of self care tasks based upon the self care categories I recently identified in my research (post about this coming soon). I think the list might be a bit too long, but there were 9 categories and I couldn’t choose. I’ll see how many I get done and adjust accordingly. Level Up Life is an app that awards you XP (experience points and stats, like a roleplaying game) for completing various activities to improve your life. I increased my XP goal for this week based on what I earned last week. However, on Sunday I purchased a plant for my home which corresponded to a significant XP gain. So, I’ve already completed my weekly goal! I have a list of blog tasks I need to complete, and I’m going to try to check off three of them this week. In addition to this post, I have 3 more in the works (categories of self care, day zero of our WDW vacation, and a Sims post). I’m also tracking a stat for the first time in awhile. What are your goals for the week? Do you use a weekly spread? A generous artist, lovely person and fellow Simmer created this portrait of me (and add quite a bit of Disney flair) after I won a giveaway she had on Twitter. It’s beautifully done, and a pretty good likeness, I think. I encourage you to follow her on Twitter: https://twitter.com/legasimmer. And to check out her gallery of work. She does take commissions! https://legasimmer.wixsite.com/gallery/gallery She has lots of pricing options, and her prices a quite reasonable. The prices are also listed on the site, so no awkward e-mails! I’m currently working on a couple of longer blog posts. One on the different categories of self care and examples of activities you can try for each one. The other post is my first post for my WDW 2019 trip report. In the meantime, here is a cat (Mike Wazowski) sitting in his toy box.